Infusing freshness into its ambience, décor and spa cuisine, Sante Spa Cuisine, in the heart of BKC, provides healthy vegetarian fare that’s organic, vegan and has a host of other health benefits. But beyond that, the food is delicious. We went in sceptical but came out transformed. Read on. 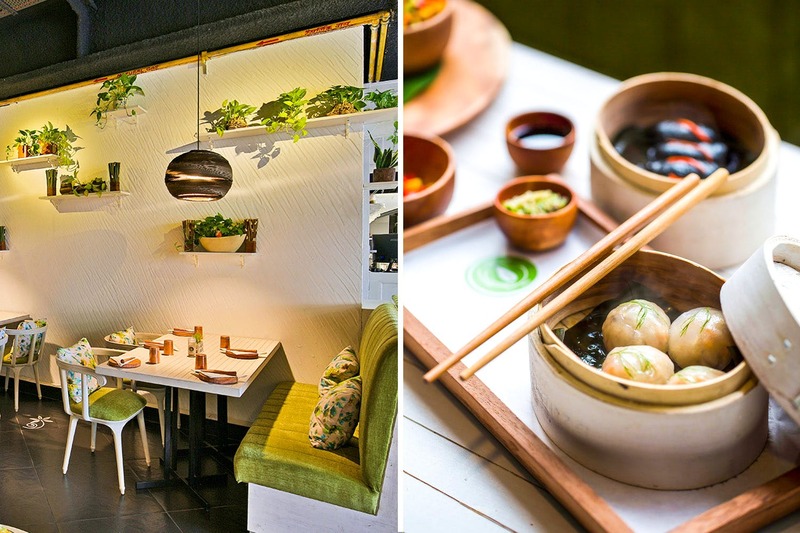 The décor reminds you of a time in South-East Asia, surrounded by bamboo walls, recycled lamps, a bookshelf with colour coded books and elements of greenery that add to the charm – neem wood plates, banana leaf straws, copper glasses for water, to name a few. The genesis of Sante goes to Sonal Barmecha, who started this in Pune and three years ago. The cuisine itself is an ode to the soul (honestly, the flavours can drive you crazy. In a good way!) where the food is sourced from heritage farms across the city, giving importance to the naturalness of the ingredients and the cooking techniques. The menu features only vegetarian dishes that are prepared with natural ingredients, following healthy cooking techniques. The menu (really interesting) has different parts that cater to different sections – a vegan menu, alkaline menu, gluten-free menu and others. We decided to try a little bit of everything to fully understand the benefits and tried their fresh breads and homemade flavoured butters (beetroot, mushroom, garlic) which were delicious. We also ordered cleansing juices (and their awesome Thandaai), with Miso soup, beetroot and spinach hummus, sautéed mushrooms with garlic, Kerala brown rice and spaghetti of vegetables. Needless to say, we loved how fresh the ingredients were and how light we felt after completing such mammoth portions of food. To end our meal, we had their dark chocolate tart and their coconut toffees (win-win in taste and presentation) and ended up with a palate cleanser before heading out and promising to visit again. The only niggling bit for us initially was the fact that they were pure vegetarian and we wondered how they could match up to their promise of goodness and freshness, but they did, and we’re definitely coming back for more. In the future, we’d love to see them spread out to the non-veg bit of things. Kaneesha Jain and her husband, Bhavesh Jain, manage the BKC outlet, so make sure you reach out to them for the day’s specials and their recommendations. So far, we’ve loved every little thing we’re tried on the menu and can’t wait to head back. Now Eat Out In A Healthy Way!